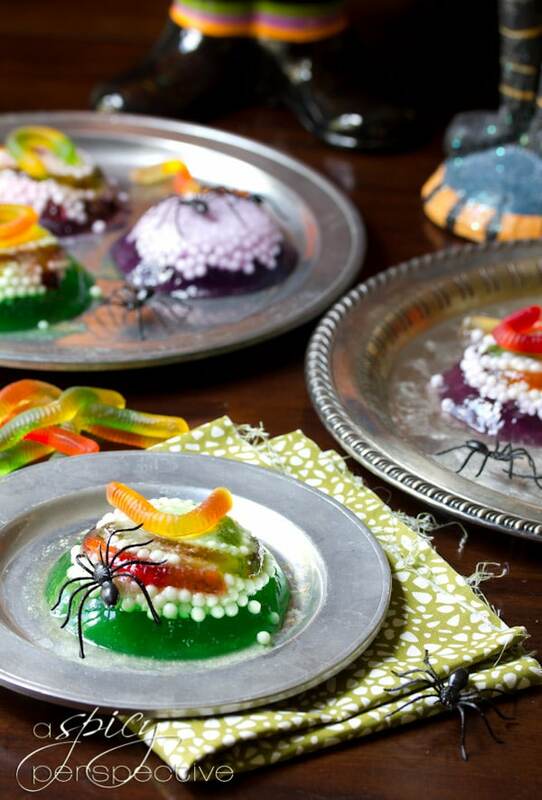 Nothing says creepy like a Halloween dessert filled with spider and worm eggs. 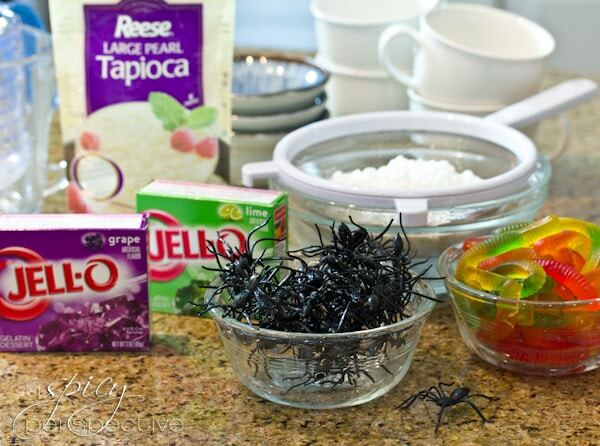 This simple Halloween Jello Treat is a disgustingly charming way to ring in the spirit of BOO! The more menacing a Halloween Dessert looks, the more my kids love it! 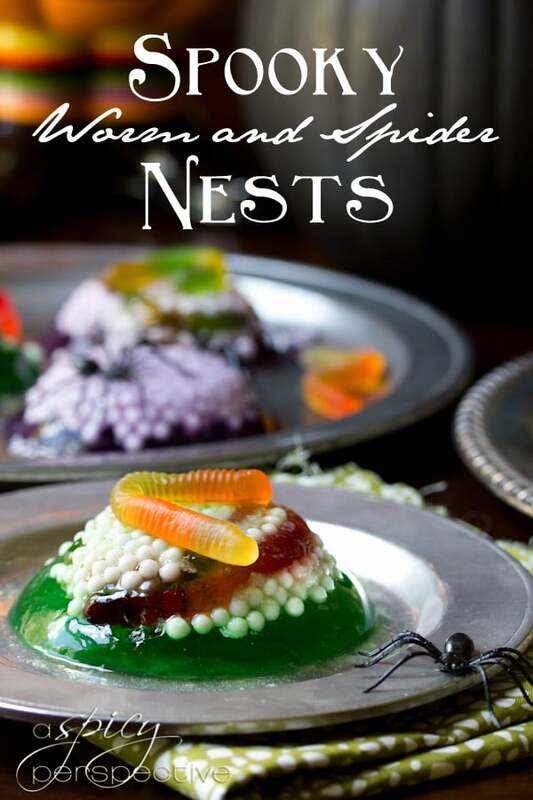 Around here, I think of the grossest, most disturbing things, like a nest with thousands of tiny spiders hatching out of eggs, make a treat out of it, and win the mommy of the year award. These Halloween Jello Treats are rated top-notch by my nine and seven year old this year. After all, what kid doesn’t like Jello and gummy worms? Large tapioca pearls make this repellent Worm and Spider Treat a real show-stopper. Simply, soak the tapioca overnight as instructed on the package. Choose Halloween jello colors and prepare the jello according to the package instructions. Placed gummy worms and spiders in the bottoms of small cups. 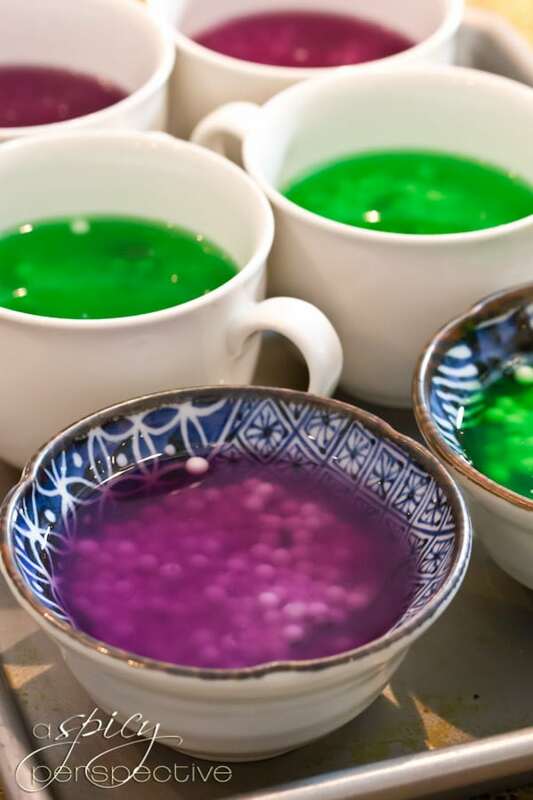 Spoon tapioca over the critters and pour the liquid jello over the top. 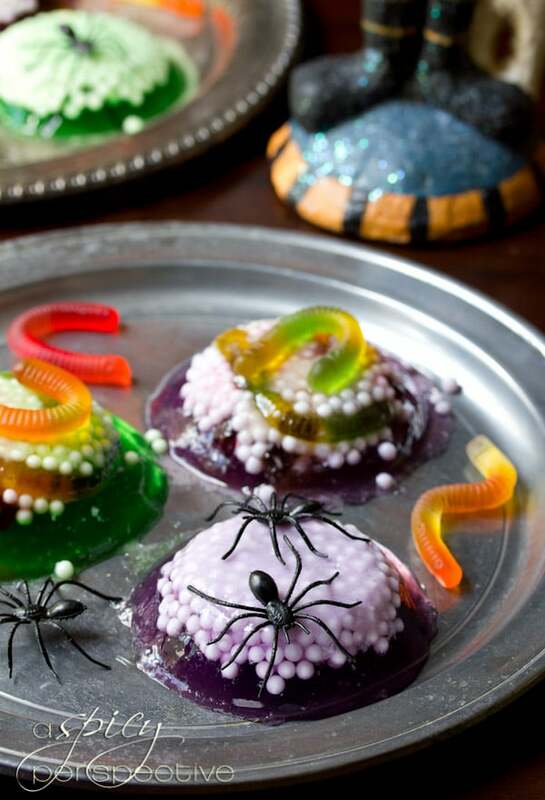 A jiggling worm and spider Halloween Jello treat that is both creepy and creative! Tons of spooky fun for very little work. 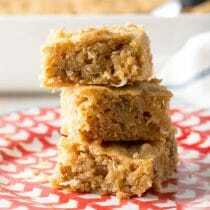 In fact, this Halloween dessert is really more of a food craft, than a recipe. But who cares as long as the little goblins are enjoying it! 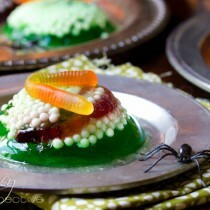 Halloween Jello worm and spider nests. Soak the tapioca in water overnight according the the package instructions. Drain. Prepare the boxes of jello in two separate containers, according to the package instructions. 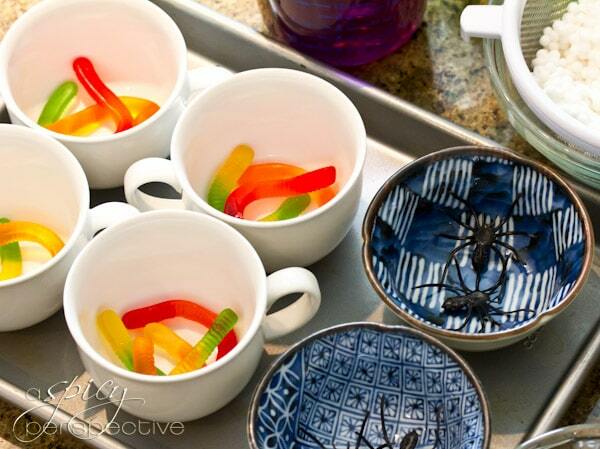 Place 2-3 gummy worms or spiders in the bottom of 10-12 small cups. Spoon the tapioca pearls over the worms and spiders evenly. Carefully pour the jello over the tapioca. Pour the green over 5-6 cups and the purple over the remaining 5-6 cups. Move to the refrigerator and chill to set, 1-2 hours until set. To un-mold, run a sharp knife around the rim of each jello cup. 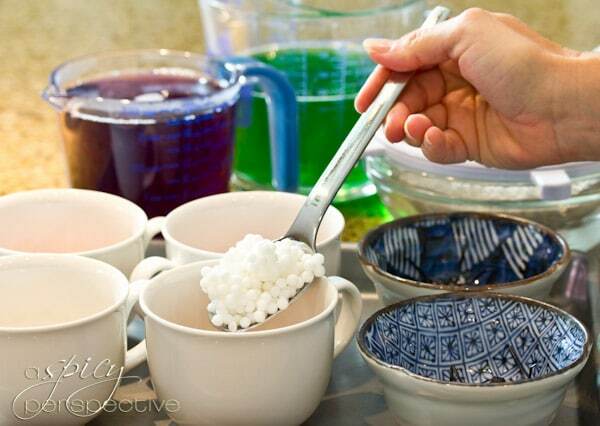 Set the bottoms of the jello cups in a tray of hot water for 30+ seconds. Flip onto a plate. Wow! Just in time for Halloween, and I tried this at home. Although it didn’t come out as good-looking as it looks here, it defo made my daughter ecstatic. She stuffed it with a dose of m&ms and finished it in no time. 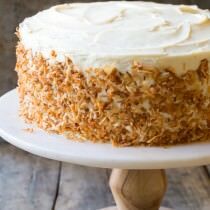 Need to up my dessert game, and I will be trying it again this weekend to perfect it. Thanks, Sommer. This is the respectable post! I have read and shared this post on my Disqus account. Thanks for sharing your great experience! I have read your post very well and noted some tips on my notebook. I will follow your instruction at my home. 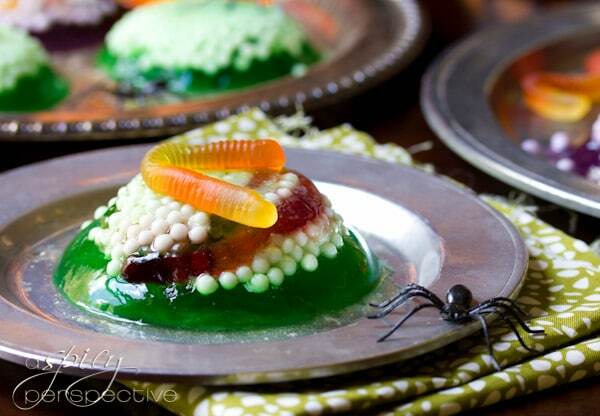 I like Spooky Worm Halloween Jello. I will make it for my baby. Please continue your writing. Do not stop! 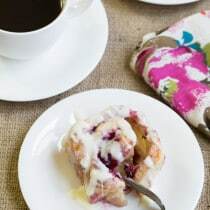 What a fun idea using tapioca! This dessert really is spooky, creepy, gross, everything that kids love! Very creative. Ha, this is so clever! The tapioca pearls are a stroke of genius. I would have been all over these when I was a kid! You are too much! I have a subscription to your blog which did not deliver this (I think it was just too scary!) 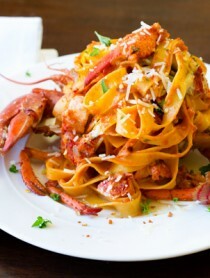 but was riveted when seeing it on Tastespotting suspecting it was YOU! Fantastically whimsical and completely creepy. You my dear are a holiday treat visionary! 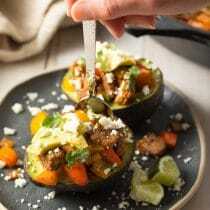 These look AWESOME! I don’t know if I would eat them…j/k! That is so awesome. I love it. You are so creative. Stop by. We are having a wonderful giveaway this week that I think you will love. haha this is actually REALLY creepy looking. Well done!!! Such a creative idea, Sommer! Kids would go crazy over these for Halloween! I’m promoting this as another fun one to do w the kids! Seriously, these are soooo creepy! I love it!! I think you like Halloween. ;-) I am loving your creations! Those are really gross. Like in a good way. Another totally gross and totally fun Halloween dessert! Thank you for sharing. What a wonderful start to my Wednesday. I hope your day is full of good food and laughter. We need more of both in this world! I can imagine my nephews would have a blast with these. Too cute!! This is so gross, but in the best way. I love the tapioca pearl spider eggs. This is awesome! 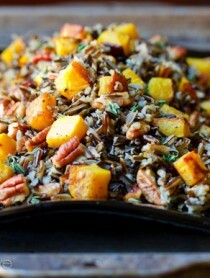 Spooky, FUN and whimsical ~ loving your Halloween treats! 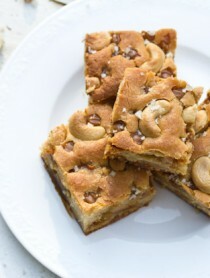 Those look totally gross, which means my kids will LOVE it! Umm, that creeped me out, Sommer. You absolutely WIN at creating the coolest, creepiest, neatest Halloween food and treats. Your house has to be amazing for Halloween! That is so fun!! It’s awesome for ANY age! !